Slim design with easy 3-fold viewing or writing stand. Smart function - It wakes and sleeps your iPad on open and close. The inside frame snugs in the tablet keeping it well protected. Inside soft lining keeps the tablet scratch free. Made in strong PU synthetic leather with cool color options. 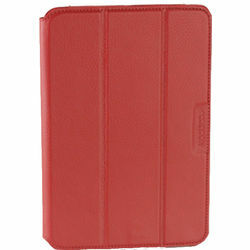 Slim design with easy 3-fold viewing or writing stand.Smart function - It wakes and sleeps your iPad on open and close.The inside frame snugs in the tablet keeping it well protected.Inside soft lining keeps the tablet scratch free.Made in strong PU synthetic leather with cool color options.